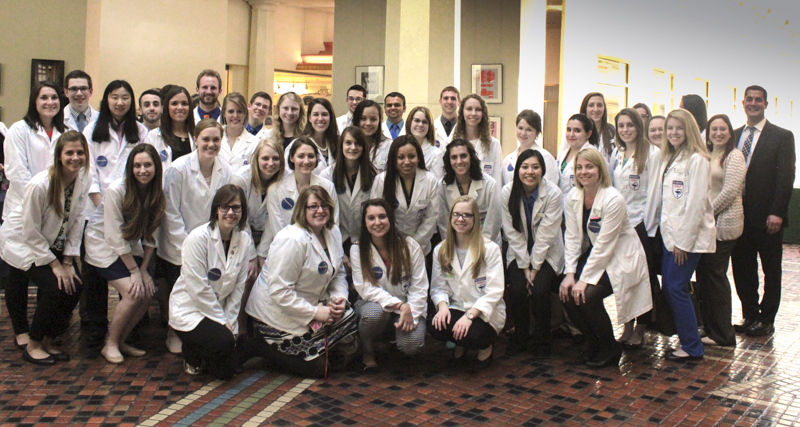 HARRISBURG, PA - Approximately 80 student pharmacists from the Duquesne University Mylan School of Pharmacy converged on the Capitol for the Pennsylvania Pharmacists Association (PPA) Pharmacy Legislative Day on Monday, April 13, 2015. The students and their faculty advisors helped to "paint" the Capitol white, wearing their identifying lab coats and pushing the importance of "Pharmacists: Your Medication Experts!" Over 275 pharmacy students from the seven Schools of Pharmacy across the Commonwealth and more than 80 pharmacists, walked the halls of the Capitol, participated in the Pharmacy Rally and made legislative visits. Each of the seven Pennsylvania Schools of Pharmacy also had displays showcasing information on the value pharmacists provide and performed various health related screenings. Information on DermaView, carbon monoxide, poison prevention, asthma, allergic rhinitis, blood pressure, Script Your Future, collaborative practices, medication review, blood glucose, and immunization awareness was displayed in the East Wing Rotunda throughout Pharmacy Legislative Day. Duquesne University's table focused on DermaView and Carbon Monoxide Screenings. The Pennsylvania Pharmacists Association also arranged for group tours of the Capitol and some special legislative meetings for students.